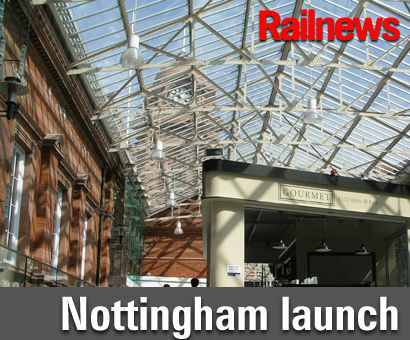 NOTTINGHAM station’s new Southern Concourse has been officially opened to the public. The new glass fronted concourse combines new structural elements with the original 1904 station, improving interchange opportunities with other modes, especially NET trams. The current tram terminus in Station Street will be moved to become new platforms next to the Southern Concourse when the tram lines now under construction on a bridge spanning the station are opened around the end of this year. There will still be access to tram services from Station Street, because passengers will be able to walk across the bridge alongside the tram lines. The new concourse is part of a £50 million upgrade of the station, which also includes a refurbishment of the existing main concourse and the restoration of some original features which had become concealed over the years. Other new features of the project include a 950-space car park and a cycle hub which will offer changing facilities, cycle hire and access to secure cycle parking. Shadow rail minister and Nottingham South MP Lilian Greenwood, East Midlands Trains managing director David Horne, City Councillor Jane Urquhart, portfolio holder for planning and transportation and Network Rail area director Justin Page were at the station on 2 June to open the concourse. MP Lilian Greenwood said: “The ambitious project to transform Nottingham station is creating a gateway and transport interchange befitting the city and I’m delighted that the new Southern Concourse has now been completed. David Horne of EMT said: “We know that everybody has been eager to see this latest major phase of the Nottingham redevelopment project, which will connect the station and car park, resulting in quicker and more convenient access for our passengers. A new commemorative photo display was also unveiled in the concourse celebrating more than a century of Nottingham station, featuring a collection of key milestones and interesting stories from the last 100 years. The range of images, provided by the Nottingham Post and Picture the Past, show key historical events such as the Great Nottingham Floods in 1947, the station celebrating the Nottingham Forest Cup Win in 1959 and more recent events including the Queen’s Jubilee Tour in 2012 and the completion of the associated £100 million Nottingham resignalling improvement project in 2013.